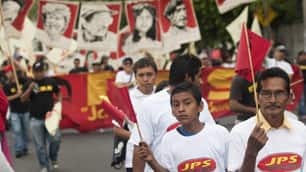 Millions of people marched in cities around the world Saturday to mark May Day, or International Workers’ Day, as they rallied for better work conditions, higher wages and laws that are more just. Demonstrators poured into the streets from Hong Kong to Moscow to Santiago, Chile, waving flags, beating drums and dancing to music. About 140,000 jubilant workers gathered in Istanbul’s Taksim Square in the first celebrations at the site since dozens of people died there in a May 1 gathering more than three decades ago. The Istanbul demonstrations marked a special victory for Turkish unions, which had been denied access to Taksim Square since 1977, when 34 people died after a shooting triggered a stampede. The culprits were never found and workers on Saturday demanded an inquiry into the demonstrators’ deaths. Thousands joined peaceful May Day marches in Stockholm, where opposition leader Mona Sahlin blamed the centre-right government for failing to stem rising unemployment and eroding the nation’s cherished welfare system. Sahlin is hoping to become Sweden’s first female prime minister after national elections in September. In Manila, Philippine President Gloria Macapagal Arroyo announced she had ordered the labour secretary to speed up negotiations between unions and employers on a $1.70 increase in the daily minimum wage. In Toronto, a few thousand demonstrators pressed for reforms to make it easier for refugees to seek haven in Canada and for immigrants to come to the country. In Indonesia’s capital, Jakarta, thousands of workers marched on the presidential palace, shouting: “Workers unite! No more layoffs!” Rally organizer Bayu Ajie said a free-trade agreement with China had cost jobs, decreased wages and encouraged corruption. President Susilo Bambang Yudhoyono promised to create safer working conditions and improve job prospects if the workers maintained political and economic stability. France saw rallies that drew hundreds of thousands of people to the streets of Paris, Marseille, Lille and other cities, but the turnout nevertheless disappointed labour unions that had been hoping for crowds in the millions to provide a show of force against a planned pension overhaul. A rare opposition march took place in Moscow, where former world chess champion Garry Kasparov, now an opposition politician, led activists calling for the ouster of Russian Prime Minister Vladimir Putin, whom they accuse of stifling democracy. 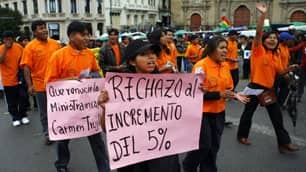 In La Paz, the Bolivian capital, marchers carried signs denouncing the government’s proposed five per cent hike in the minimum wage as too paltry. About 1,000 protesters — among them bus drivers and janitors — took to the streets in Hong Kong to demand that the government enact a minimum wage of the equivalent of $4.35 an hour. Though the Chinese territory has some of the richest residents in the world, its wealth is too unevenly distributed, advocates say. Most of the annual May Day marches were peaceful, but in Santiago, clashes broke out with police, who launched tear gas and deployed a water cannon against demonstrators. Athens also witnessed riots, with police using tear gas to disperse demonstrators who threw firebombs and stones in a large rally against austerity measures imposed to secure loans for near-bankrupt Greece. In Switzerland, Zurich police used water cannons in an attempt to disperse dozens of stone-throwing protesters as unions and politicians protested against “excessive” Swiss banking bonuses. 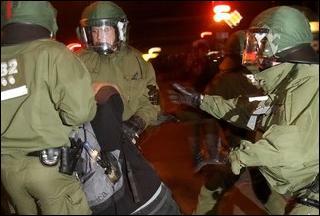 German police detained 250 neo-Nazis who attempted to attack them in downtown Berlin. Riot police made targeted arrests during clashes on May Day demonstrations in Berlin. May Day demonstrations have turned violent after police battle rioters in two German cities, using water cannons to drive back crowds of protestors. In the capital Berlin, police tried to disperse hundreds of left-wing protesters in the west of the German capital late Saturday, as they set cars on fire and demolished police vehicles. The eastern side of the city also saw clashes between anti-Nazi demonstrators and right-wingers. In the port city of Hamburg, some 1,500 leftist radicals held a parade that continued into the early hours of Sunday. Police said the protestors vandalized banks, overturned parked cars and set them on fire. It has become a ritual for leftists and rightists to engage in violent clashes with police and storm banks and shops on the May Day for more than a decade in Berlin and Hamburg. Some 7,000 riot police were deployed to keep the two groups apart. Nearly 20 people were injured in those clashes. Police said they have made more than 250 arrests. Last year’s May Day in Berlin was the most violent in a decade with hundreds of arrests and dozens of police officers injured. More than 400 cars were set ablaze in Berlin and Hamburg. May Days have traditionally been an opportunity for workers and the left in general, to let off steam. Tens of thousands of people have marched in cities from Hong Kong to Istanbul to mark International Worker’s Day, demanding more jobs, better work conditions and higher wages. In Turkey, about 140,000 workers gathered in Istanbul’s Taksim Square in the first celebrations at the site since 34 people died there in a May 1 gathering more than three decades ago. The demonstration was a special victory for Turkish labour unions, which had been denied access to the site since 1977, after a shooting triggered a stampede. Aydin Demir, a 44-year-old kiosk owner, said labourers had won a 33-year-long struggle for their right to rally at the square. “We paid a heavy price to be here today. Thousands of comrades have been arrested, but now we get the result of our struggle,” he said. Al Jazeera’s Anita McNaught, reporting from Taksim Square, said that in the past, trade unions who tried to hold rallies there in defiance of the ban met with a heavy police crackdown which left dozens injured and hundreds in detention. “Then human rights and especially workers rights were crushed for years in Turkey,” McNaught said. “Over a series of years, particularly the last three, the unions have steadily pushed and pushed to be reallowed access to back to this square. More than 22,000 police officers were deployed for the rally and demonstrators went through security checks before entering the square. Zafer Yoruk, a professor of political science at Izmir University, said the number of workers organised in Turkish unions has fallen dramatically since the 1970s. “Regarding unionisation and economic rights, I think we’re far behind the 1970s,” he told Al Jazeera. Most of the annual May Day marches were peaceful, but in the Chinese territory of Macau police used water cannon and pepper spray against rowdy protesters, injuring at least eight people, including a photographer. Hundreds of thousands of people joined rallies in Europe, many protesting against government austerity policies in the wake of the global financial crisis. Athens, the Greek capital, witnessed riots, with police using tear gas to disperse demonstrators who threw firebombs and stones in a large May Day rally against austerity measures needed to secure loans for near-bankrupt Greece. In Switzerland, Zurich police used water cannon in an attempt to disperse dozens of stone-throwing protesters as unions and politicians protested against “excessive” Swiss banking bonuses. In Germany, police said 17 officers had been injured when they clashed with 150 demonstrators who threw paving stones and set garbage cans ablaze in the northern port city of Hamburg. At least nine demonstrators were detained after the confrontations with police on the eve of Saturday’s May Day holiday, the German news agency DDP reported. Several hundred officers were deployed in the capital, Berlin, ahead of a planned neo-Nazi march and other demonstrations. The turnout in Cuba was massive, as expected, and authorities claimed the march by hundreds of thousands of Cubans amounted to approval of the island’s communist system amid mounting international criticism over human rights. Bayu Ajie, a rally organiser, said a free-trade agreement with China had cost jobs, decreased wages and encouraged corruption. 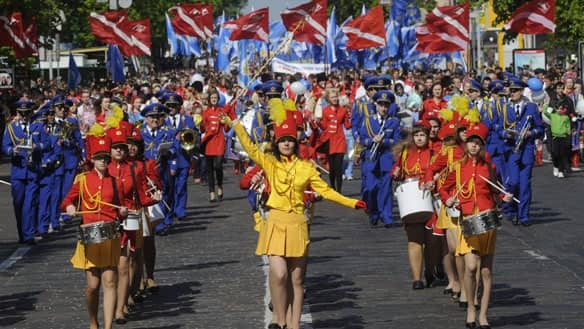 In Russia almost two million people turned out to mark international worker’s day. Demonstrators carrying red balloons, red Soviet flags and portraits of Soviet leaders Vladimir Lenin and Josef Stalin, called for the Russian government’s resignation over rising prices and unemployment in Moscow. Thousands of Cambodian workers marked May Day by marching through the capital to demand better work conditions and the establishment of a labour court. Thousands of workers in the Philippines also took to the streets to reiterate their call to the government to protect jobs and to safeguard the interests of workers. In the South Korean capital, Seoul, about 20,000 people gathered to demand better working conditions for labourers and farmers. In Tokyo and Taiwan, thousands marched for better working conditions and permanent jobs. In Kuala Lumpur, the Malaysian capital, several hundred workers protested a proposed four per cent goods and services tax. While, in Hong Kong, about 1,000 protesters, including janitors, construction workers and bus drivers, demanded the government introduce a minimum wage of $4.30. STANBUL (AP) – Tens of thousands of workers marched in cities from Hong Kong to Istanbul Saturday to mark international worker’s day, demanding more jobs, better work conditions and higher wages. The demonstrations in Istanbul, which sits on both European and Asian continents, marked a special victory for the Turkish unions, which had been denied access to the Taksim Square since 1977, when 34 people died after shooting triggered a stampede. The culprits were never found and workers demanded Saturday an inquiry into the deaths of the demonstrators. Most of the annual May Day marches were peaceful, but in the Chinese territory of Macau police used water cannons and pepper spray against rowdy protesters who tried to break away from the approved route. Hong Kong radio RTHK reported at least eight people injured, including a photographer. Athens also witnessed riots, with police using tear gas to disperse demonstrators who threw firebombs and stones in a large May Day rally against austerity measures needed to secure loans for near-bankrupt Greece. In Switzerland, Zurich police used water cannons in an attempt to disperse dozens of stone-throwing protesters as unions and politicians protested against “excessive” Swiss banking bonuses. German police detained 250 neo-Nazis who attempted to attack them in downtown Berlin, while they braced for further clashes after sundown. Nadine Pusch, a spokeswoman for Berlin police, said 7,000 officers were scattered throughout the city in an effort to ensure peaceful demonstrations. Overnight in Hamburg, 17 officers were injured in clashes on the eve of May 1 and at least nine demonstrators were detained, the German news agency ddp reported Saturday. Several thousand demonstrators in Paris also took to the streets amid concerns about conservative President Nicolas Sarkozy’s plans to overhaul the pension system. In Manila, President Gloria Macapagal Arroyo announced she had ordered the labour secretary to speed up negotiations between unions and employers on a 75-peso ($1.67) increase in daily minimum wage. In Indonesia’s capital, thousands of workers marched on the presidential palace, shouting: “Workers unite! No more layoffs!”. Rally organiser Bayu Ajie said a free trade agreement with China had cost jobs, decreased wages and encouraged corruption. President Susilo Bambang Yudhoyono promised to create safer working conditions and improve job prospects if the workers maintained political and economic stability. Thousands of Communist demonstrators, carrying red balloons, red Soviet flags and portraits of Soviet leaders Vladimir Lenin and Josef Stalin, called for the Russian government’s resignation over rising prices and unemployment in Moscow. Former world chess champion Garry Kasparov led hundreds of opposition activists in a separate rally. They also called for the ouster of Prime Minister Vladimir Putin, whom they accuse of stamping out democracy. A few thousands also rallied in Ukraine’s capital. In Seoul, South Korea, Tokyo and Taiwan, thousands marched for better working conditions and permanent jobs. Jeong Ho-hee, spokesman of the Korean Confederation of Trade Union, vowed to fight against long working hours and high death rate related to industrial accidents. In the Malaysian capital, Kuala Lumpur, several hundred workers protested a proposed 4 per cent goods and services tax while about 1,000 protesters, including janitors, construction workers and bus drivers, demanded the government in Hong Kong to introduce a minimum wage of 33 Hong Kong dollars ($4.30). This freewheeling capitalist Chinese enclave is one of the world’s wealthiest cities, but critics say its wealth is concentrated in the hands of a few. Israeli troops attack protesters injuring and killing Again!